Inequality is a multidimensional phenomenon though it is often discussed along a single dimension such as income. This is also the case for the various decomposition approaches of inequality indices by recipients or income sources. 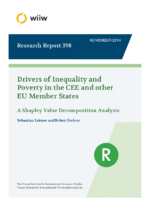 In this paper we study one- and multidimensional indices on inequality on data for CEE EU Member States in comparison to other EU countries including four dimensions in our measure of multidimensional inequality: income, health, education, and housing, and apply various decomposition methods to these one- and multidimensional indices and also to a poverty index. In doing so, we apply standard decomposition techniques to the Mean logarithmic deviation index (I₀) and decompositions based on regression analysis in conjunction with the Shapley value approach to Gini indices.